Hugh enlisted on 8th May 1912. He was 22 years and 2 months old, and was a Clerk by trade. He entered the war in France on 14th August 1914, as part of the 4th Bn. Middlesex Regiment, Regimental Medical Officer's team. He received a shell wound to his left foot and left eye on 27th August 1914, and was captured by the Germans. After being repatriated he returned to the UK and was admitted into the Cambridge Hospital, Aldershot on 24th July 1915. 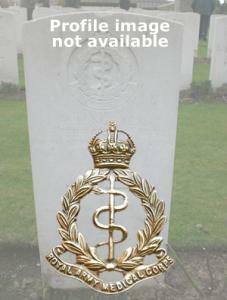 He was discharged “no longer physically fit for war service” on 5th August 1915.